Biodanza came from his passion for expression and for people. First he occupied the chair of Psychology of Art and Expression at the Institute of Aesthetics of the Pontifical University of Chile. Then he started teaching at the Center for Anthropological Medical Studies of the School of Medicine of the University of Chile. During this period he developed Biodanza, both as the result of his personal and working experiences and as a consequence of his studies in Biology. Studying psychiatric patients at the Psychiatric Hospital of Santiago del Chile, Rolando Toro discovered that some music and dances can stimulate positive feelings like vitality, creativity or the joy to be with someone else. He continued studying, researching and teaching Biodanza all his life. 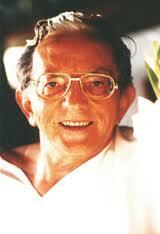 He brought Biodanza to all the countries of Latin America, to Europe and many more places. With Biodanza Rolando Toro wanted to give people a second chance, the chance to start looking at their life from a positive point of view and enhancing the positive aspects. Rolando Toro was also a painter and a poet, he loved this form of expression where we can feel the heart of the world beating. I'm glad I had the chance to meet him and to do several workshops with him. I'll always remember him as a person with a big open heart and a deep love for people and for life.